About Traditional TaeKwon-Do Tournament and how it all started. Singapore Taekwon-do Academy (STA), at Nanyang Technological University (NTU)holds theTraditional TaeKwon-Do Tournament annually, attracting overseas universities' interest and participation. 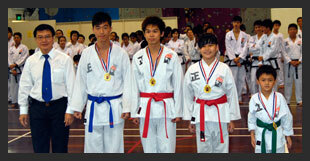 NTU Traditional TKD Club was founded by Grandmaster B.S. Huan over 25 years ago. Master Lim Sui Soon, 6th Degree BlackBelt, a graduate of NTU is in charge of STA Traditional TKD Club at NTU. The tournament has helped to build strong rapport with tertially students from both Singapore and across the Causeway, Malaysia. Since 2009, STA has organized several Traditional TaeKwon-Do Tournaments (T3) for our students of all levels, both male and female. The next T3 will be held on 2018 date (TBC). Contact your Instructor for your registration or you may call us at +(65) 6585 0553 to enquire. The Traditional Taekwon-do Tournament (T3) 2018 is not open for registration yet. For more infomation, kindly refer to our STA page on FB here. T3 Group Pattern & Breaking Events applications are to be submitted to the STA instructors by the closing date on TBC. T3 Individual Pattern & Sparring Event applications are to be submitted, in person, to STA admin on the weighing day on TBC. Download T3 Application & Health Declaration Form. T3 Sparring balloting will be conducted on TBC. Only students from STA Taekwon-do clubs are eligible to participate in the T3 events. All STA students must be actively training at their respective STA Taekwon-do club for a minimum of 6 months before they are eligible to participate in the T3 event. All STA students are eligible to participate in the T3 Patterns events. Only Blue Belts 4th Kup to Black Belts 3rd Dan, as of 18 August 2013 are qualified to participate in T3 Sparring & Breaking events. Students aged 13 years and above, as of 18 August 2013, are allowed to participate in T3 Sparring and Breaking – 4 Directions events. All Sparring participants must attend the T3 Training and Safety Briefing on TBC, prior to the tournament. No training fees are required. Kindly contact your Instructor for informations on categories and events for T3. For furthur informations call STA +(65) 6585 0553.